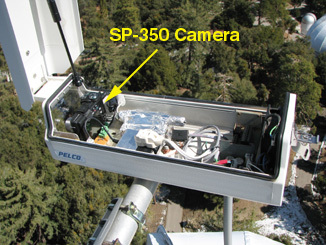 The Towercam unit is mounted at the very top of the UCLA operated 150-Foot Solar Tower at Mount Wilson Observatory. The base of this solar telescope is at an elevation of 5,672 feet above mean sea level. 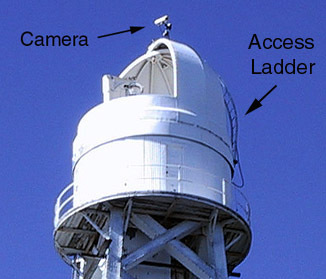 The towercam itself is mounted to the curved dome access ladder which is attached to the upper pivot-point of the dome. This puts the lens of the Towercam at an elevation of about 5,845 feet. 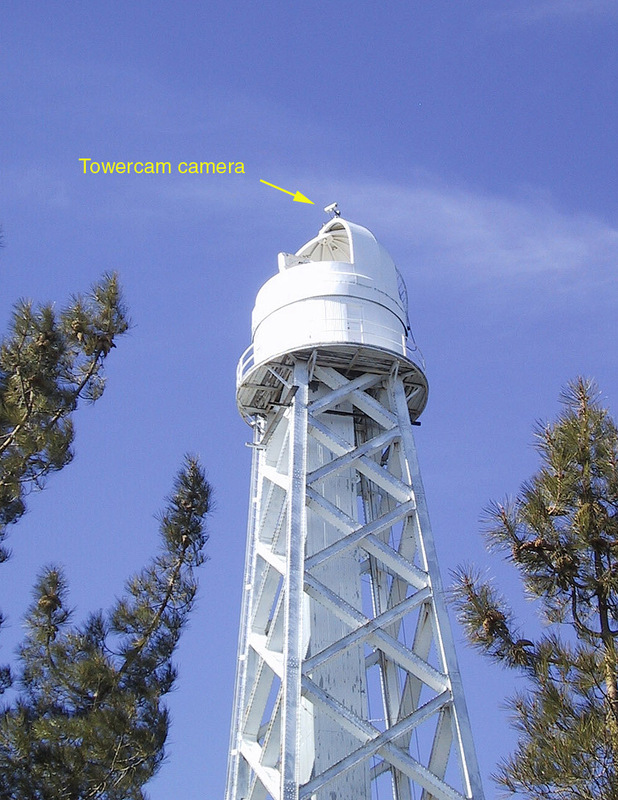 Typically (for its default position), the towercam points northeastward toward the 100-inch telescope dome with an azimuth reading of about 45 degrees east of true north. The camera is an Olympus SP-350 Digital Camera placed inside a Pelco EH4700 environmentally controlled camera enclosure. The camera enclosure has a small fan and heater inside it to keep the front window free of fog. The AC adapter for the camera and the receiving end of the USB extender is also located within the Pelco enclosure. The camera is controlled by Erdman Video System's VM95 camera software running on a Dell Dimension C-521, 1 Ghz computer under Windows XP. The computer communicates with the camera via USB, but by using StarTech USBthere extenders. Without these extenders, the data rate between the camera and the computer would be very slow over the 230 foot data cable. 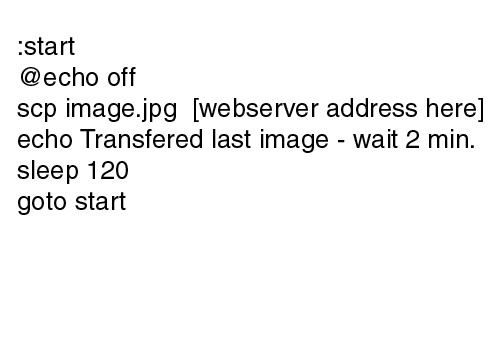 Images are scheduled to be taken every 2 minutes and are automatically uploaded to the internet server using a simple DOS SCP batch file. 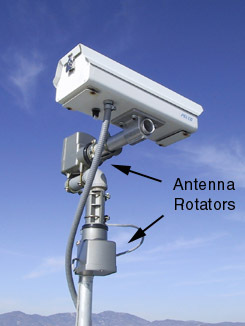 The towercam is located only 1/4 mile from one of the strongest sources of commercial radio frequency interference in the world. Almost every Los Angeles television station has a broadcast antenna located on Mount Wilson. There are also numerous FM stations up here as well. Therefore, the data cables between the camera and computer need to be heavily shielded, grounded, and choked against RFI. 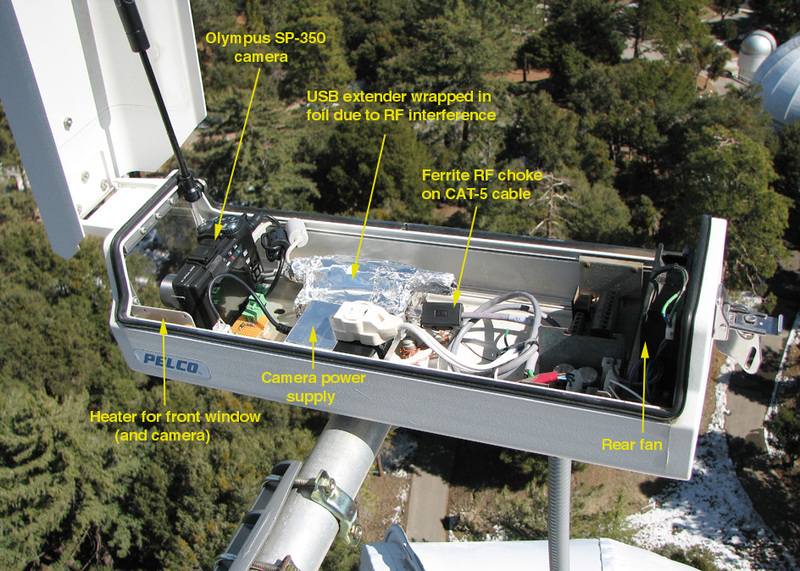 In the larger version of the camera enclosure image above, notice the use of grounded aluminum foil tape and ferrite chokes. 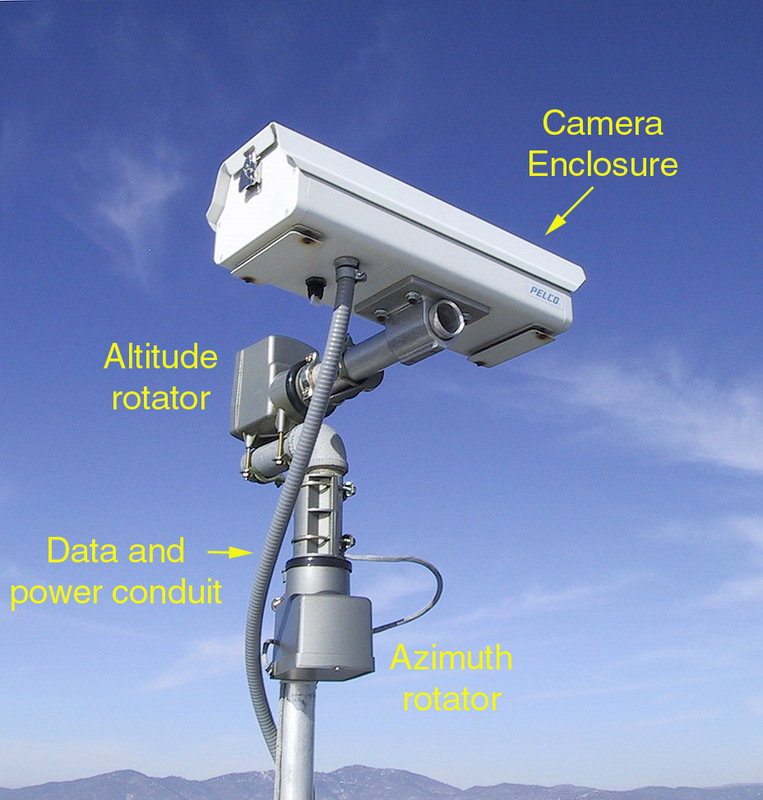 Towercam movement is controlled by using two standard TV antenna rotators, mounted at right angles to each other. Therefore, rotation can be done in both the horizontal and vertical plane, and is manually controlled by the solar observer on duty. The field of view covers 360 degrees in the horizontal plane, and about 90 degress in the vertical. Additional information can also be found at the Towercam FAQ page. The platform which the Towercam sits on is attached to the dome's outside access ladder. This ladder is held in one position using guy wires but has wheels at its base to allow the dome to rotate underneath it. However, the ladder's central pivot point has a lot of (intentional) slop built in to it, so depending on where the dome ends up facing at any given time, the ladder may also end up in a slightly non-level position. This results in the camera pier being tilted a bit, which sometimes cause the images to show a skewed horizon. Annoying, since the amount of skew is somewhat random and there is not much we can do about it from below! At some point we will look into re-engineering the pivot point to prevent the ladder from flopping about. Page content and all images © 2003 The Regents of the University of California. All rights reserved.